Think BIG, Invest much time and do Big and become Biggest. Don't try to hide yourself from blog, just told others at least in virtual world that this is your blog, it will increase trust authority and of course branding. Have faith and get motivation to work for long time. Always set a short term goal and try to achieve it before time. Infolinks- well, it was first time when I got offer from someone to join this network I could not remember about that person and it was amazing experience for me, because I have seen ECPM more than $7 and that's just awesome. Chitika- From this network I got paid couple of times, but because I was moving to different ad networks time to time to test and write on blog so I did not use this ad network on my blog for long time, but still I have earn about $40 from this network, if you want to read Chitika Review & Payment Proof then you can get details information about it. Udemy- I must say this is doing awesome job, because they have about 10 million existing students and it is growing pretty well, actually I have interviewed couple of successful people of Udemy and can you believe one of my friend earn $10,000 from Udemy. Above all affiliate networks are good but, these days I am not just interested to promote other people products, I am just putting effort to create my own products and in 2016 I will give 200% to make my products more helpful for internet users. Ad Networks- If you want to earn money from ad networks only then you must need to think about traffic and having traffic on the blog, because it is the only way to generate good revenue. Affiliate Networks- This is really required tips, tricks and of course patience to get success but yes it is really one of the most profitable business in the internet to earn BIG commission with little effort, but certain things, you required and the most important things is building e-mail list and for this you need to have a professional e-mail marketing partner for you. I must say to you CONGRATULATIONS! Hey, listen, if you have tried blogging & earn money online too, then here is it, yes here is it now I am going to open door for all those wanted to start a blog and earn money, I will teach you to earn money online. In this world everything having some advantages and some disadvantages and of course you need to find out the best reason in the advantage part to do something that's why it can change people life, if you can do anything which can help human beings through internet then you can easily build internet business, but finding that thing is tough that's why there are only few those are doing real business online. See, Google, Facebook, Twitter, Pinterest and there are other several companies, why these companies are popular because they solving people problems that's why they are even growing day by day and there are many those came up with new idea like Quora, Snapdeal, Flipkart these guys are also doing pretty well. Its your time. Is there anything I missed let me know? 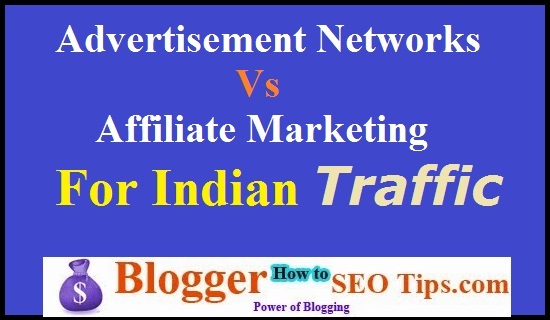 Thanks buddy for your continuous support and of course this is really a helpful blog post to choose affiliate marketing or advertisement network for bloggers.